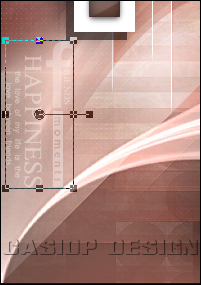 Place the selections 'cas_Happiness_Sel1', 'cas_Happiness_Sel2 and 'cas_Happiness_Sel3' in the Selections folder to your PSP program. 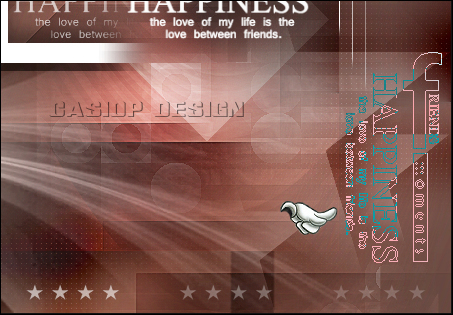 Place the brush 'text brushes_2' and 'BrushTip_text brushes_2' in the Brushes folder to your PSP. 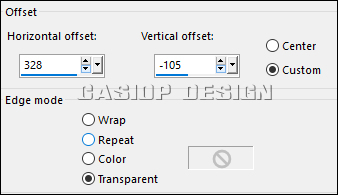 Double-click on the Preset 'cas_Happiness_Glass' and it is automatically imported into Alien Skin Eye Candy 5: Impact - Glass. 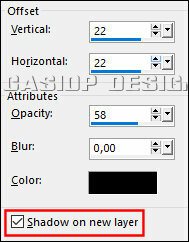 If you use other colors, you can change Blend Mode and Opacity for a better result. Open New Transparent Image 900 x 500 pixels. 2. 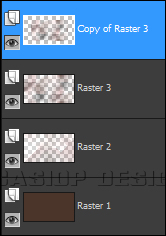 Layers - New Raster Layer, Raster 2. Flood Fill with the gradient. Adjust - Blur - Gaussian Blur 50. 5. 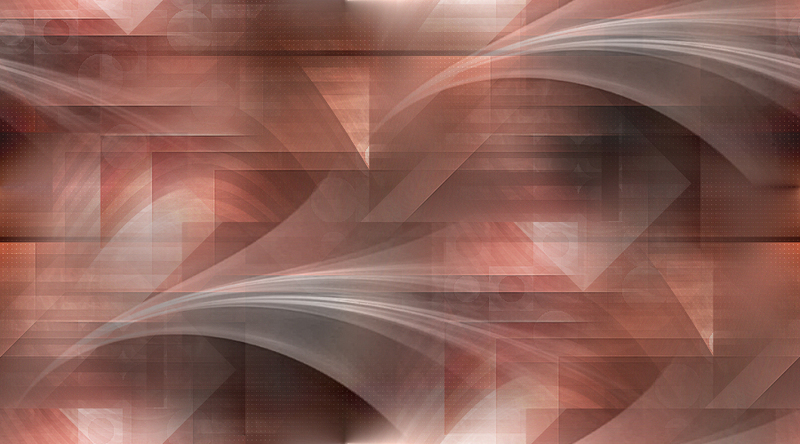 Layers - New Raster Layer, Raster 3. 7. Effects - Plugins - MuRa's Meister - Copies. Adjust - Blur Gaussian - Blur 26. Adjust - Sharpness - Sharpen More. In the Layerpalette, set Blend Mode to Overlay. 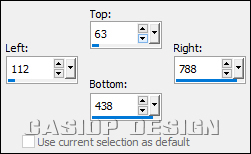 Image - Resize 75%, uncheck All Layers. Adjust - Sharpness - Sharpen. Check in Shadow on new layer. uncheck Shadow on new layer. To set Overlap X to -49, push the blue slide to the left. In the Layerpalette, set Blend Mode to Soft Light. 15. 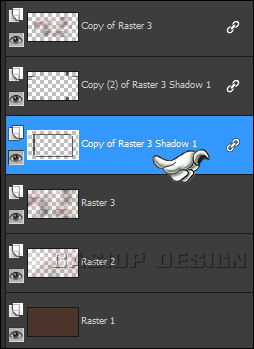 Activate the layer Copy of Raster 3 Shadow 1. 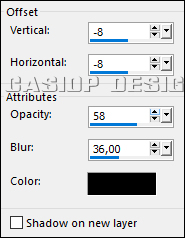 Adjust - Blur - Gaussian Blur 26. In the Layerpalette, set Blend Mode to Burn. 18. 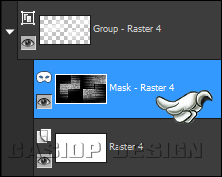 Activate the top layer, Copy of Raster 3. 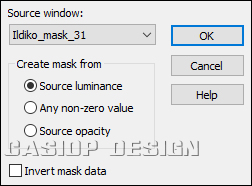 Open Mask 'Ildiko_mask_31' and minimize it. Change the foregroundcolor to #ffffff (white). Layers - New Raster Layer, Raster 4. Flood Fill the layer with the foregroundcolor (white). 19. Layers - New Mask Layer - From Image. Layers - Merge - Merge Group. 20. We will now make a new Mask on the Mask, you just made. 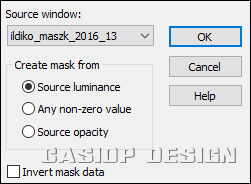 Open Mask 'ildiko_maszk_2016_13' and minimize it. Layers - New Mask Layer - From Image. In the Layerpalette, set Blend Mode to Hard Light and Opacity to 40. 22. 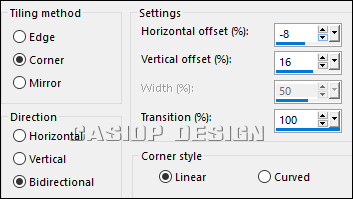 Layers - New Raster Layer, Raster 4. Flood Fill with the foregroundcolor (white). Layers - Merge - Merge Visible. 25. 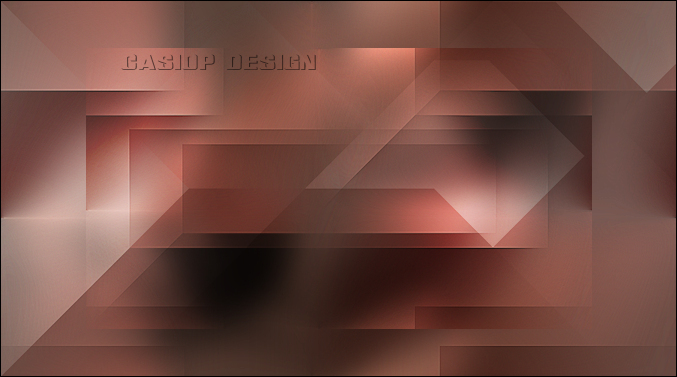 Layers - New Raster Layer, Raster 1. 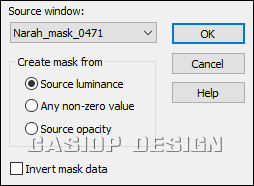 Open Mask 'Narah_mask_0471' and minimize it. 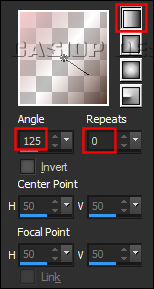 In the Layerpalette, set Blend Mode to Luminance (Legacy). 27. Layers - New Raster Layer, Raster 1. Selections - Load/Save Selection - Load Selection from Disk. Flood Fill the selection with the foregroundcolor (white). Edit - Copy, close it down. On your image, Edit - Paste as New Layer, Raster 2. In the Layerpalette, set Blend Mode to Screen. On your image, Edit - Paste as New Layer, Raster 3. 32. Activate the bottom layer, Merged. Activate the top layer, Raster 3. 33. 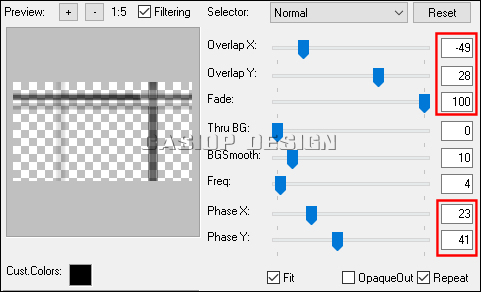 Layers - New Raster Layer, Raster 4. 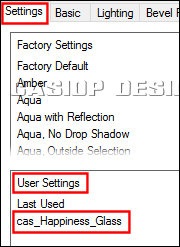 Selections - Load/Save Selection - Load Selection like before, but find 'cas_Happiness_Sel2'. Flood Fill selectionen with the foregroundcolor (white). Selections - Modify - Contract 15 pixels. 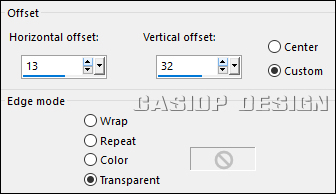 Edit - Paste into Selection. 34. Keep the selection on. Effects - Plugins - Alien Skin Eye Candy 5: Impact - Glass. On your image, Edit - Paste as New Layer, Raster 5. On your image, Edit - Paste as New Layer, Raster 6. 38. Effects - Plugins - MuRa's Meister - Copies. 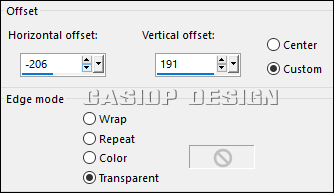 Image - Resize 85%, uncheck All Layers. In the Layerpalette, set Opacity to 60. 39. 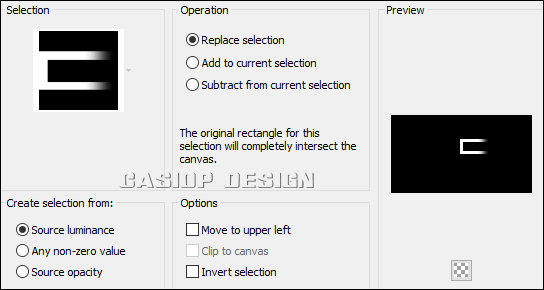 Layers - New Raster Layer, Raster 7. In the Layerpalette, set Blend Mode to Overlay and Opacity to 38. Image - Resize 70%, uncheck All Layers. 41. Open the tube 'MR_Autumn Portrait by Artur K'. On your image, Edit - Paste as New Layer, Raster 8. 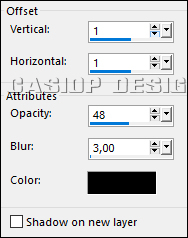 Image - Resize 65%, uncheck All Layers. Edit - Clear, or hit the Delete key on you keyboard. Activate the original layer, Raster 8. 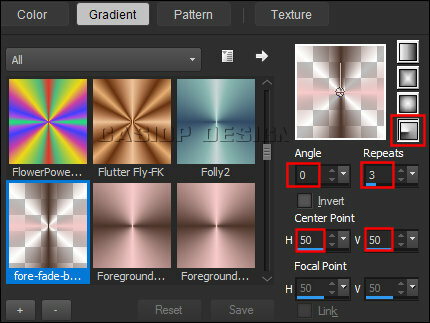 In the Layerpalette, set Blend Mode to Multiply. Layers - Merge - Merge Down. 44. Layers - Arrange - Send to Bottom. Layers - Arrange - Move Up two times. 45. Activate the bottom layer, Merged. 48. Layers - New Raster Layer, Raster 1. 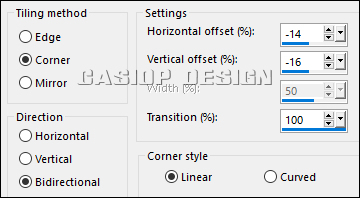 Selections - Load/Save Selection - Load Selection like before, but find cas_Happiness_Sel3'. 49. Effects - Plugins - Alien Skin Eye Candy 5: Impact - Glass. 51. 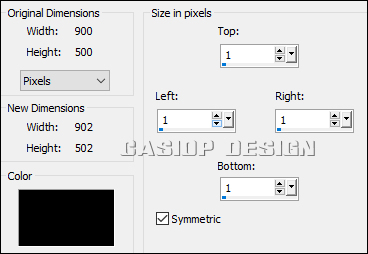 Resize your image, if you want it smaller. Sign the image or place your watermark on it and save as JPG. I hope you enjoyed my tutorial, and you are welcome to send your version to me. The versions I receive will be shown on the website with your name, unless you tell me not to.